This month, we would like to introduce several larger updates as well as give you a sneak peek into what is coming up next. Keep in mind that this release will be rolled out gradually throughout April. Once your account gets updated, you will see an in-product notification. Let us know what you think about these features in the context of your use case to help us improve. Your feedback is greatly appreciated. With the Multiple Workflows feature, Kanbanize introduces an entirely new approach of work visualization that involves multiple workflows in a single board. The new feature has a wide scope of practical implementations. It helps Project Managers and Product Owners visualize diverse processes all at one place (img.1). Each workflow has its own Cycle time configuration panel and allows process mapping with no constraints. To get more information about the multiple workflows and how to make use of them, please check the dedicated article. The introduction of Multiple Workflows has led to other product enhancements that support the feature usability in the system. It impacts the Related Board functionality that illustrates card dependencies across related boards. With Release 6.12, users can relate individual workflows from any existing Team board using the Related Board feature (img.1). This way you can connect and manage only the workflows you are interested in. Within the context of Management boards (beta), it allows users to select and display Initiatives flows across the account on a single board. This view provides global visibility of the company future goals and the progress of each department. The Global Board settings (Card size type and Allow exceeding limit) and the Cycle time settings that are configurable per board are now in a new location. The controls that were previously located in the Workspace and Board settings panel are now accessible at a board level. Users with the relevant permissions can access them via the Edit Workflow button at the top of each board. Gaining visibility across the organization. The Management Workspace will be available as an option when creating a new Workspace from the retractable menu (the plus icon) on the right bottom of your Kanbanize dashboard. 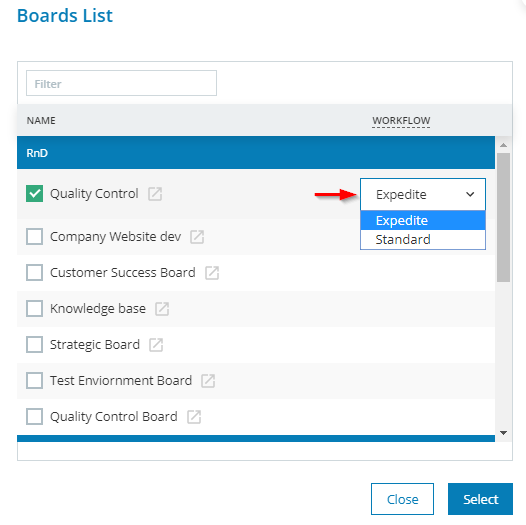 The Management Workspace capability allows Project managers to select any Kanban board they are interested in and to display their respective Initiatives flows all at one place. The boards you select usually represent projects or products that you manage across the account. This creates a unified visualization platform that allows you to watch and track the progress of all Initiatives in your projects. The new features will be delivered in a soft launch that will roll out gradually to our customer base throughout April. Your feedback will be greatly appreciated. Let us know what you think in the context of your use case to help us improve this feature. We this release, we introduce a new bi-directional integration with MS Azure DevOps. At the moment, it provides the option for linking of DevOps Work Items to Kanbanize Cards and vice-versa. For more information, please read the dedicated article.